This API allows you to purchase airtime and data directly from your wallet account. This API allows visitors on your website to purchase airtime directly from your eStore Account through the use of a web interface. After successful payment has been made, you will be credited with the amount payed and debited with the amount we charge for that airtime amount. Step 3: Copy line 2 and line 3 and paste to your desired location. We advise it should be placed close to the end of your webpage. 1. You may ignore line 2 if you have added jquery to your website already but ensure line 3 is placed below it. 2. Make sure you have enabled Airtime/Data Api Token in your account settings. Welcome to my website. You can make airtime purchase directly from this page. This API allows visitors on your website to purchase airtime directly from your eStore Account through the use of a web interface. After successful payment has been made, you will be credited with the amount payed and debited with the amount we charge for that airtime amount. 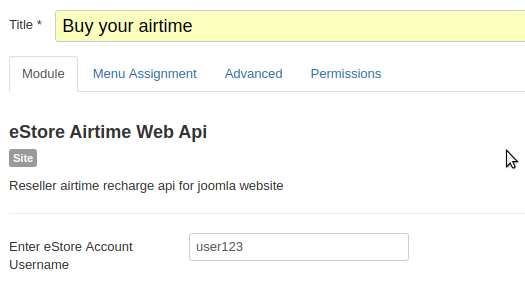 Step 2: Navigate to module manager and add new module "eStore Airtime Web Api"
1. You must enter your eStore Username in the Module manager page of your website. 2. Make sure you have enabled Airtime/Data Api Token in your account.